It's the holiday season once again, and as in previous years, the festive spirit seems to have snuck up on us while we were sipping delicious cocktails. All at once, the hallways of Alcohol Professor central are covered in colored lights and holly, there's mistletoe dangling from every doorframe, and pine needles keep ending up stuck to our clothing. We're wistfully winding up another long year of writing and imbibing, deciding what drink-themed apparel we'll wear to the big holiday party, and trying to ignore the fact that we still have to finalize our New Year's Eve plans. But before we adjourn for a few days to gather and gift with our friends and family, it's time to honor one of our favorite traditions, wherein I don my Ghost Of Christmas Past outfit and dive into my alcoholic archive in search of topical materials. 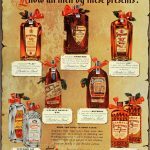 In previous years, we've looked at Bourbon's historical ties to the holidays, at classic Whiskey advertising, and offered up a pairof pieces covering holiday liquor promotions. 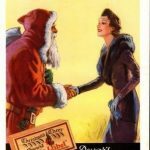 So this time around, I've decided to pull together a selection of imagery that can be broken down by category, and showcase all the different aspects of Yuletide that companies capitalized upon through the 20th Century. ...But some companies have preferred to simply utilize the classic red-and-white costume. Others have dressed up stars of stage and screen, celebrating the spirit with well-known celebrities. And sometimes, they didn't even do anything more than showcase Kris Kringle's disembodied hands, leaving it to the audience to fill in the rest of the story. 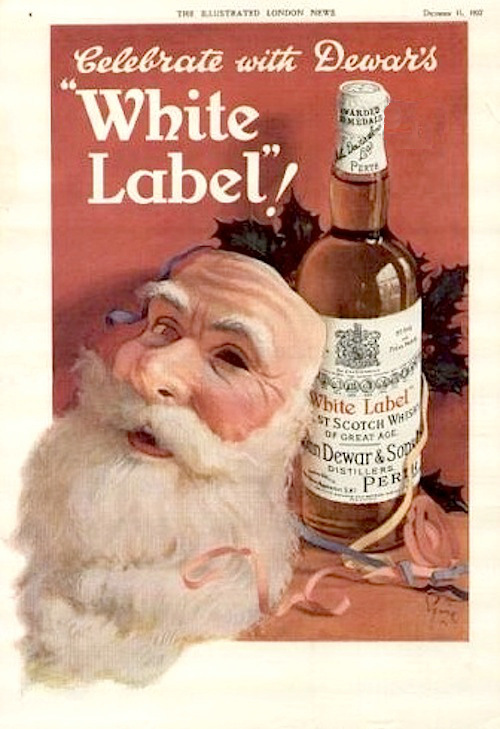 Thankfully, though, Dewar's failed in their attempt to create a craze for creepy Claus masks. Christmas trees are a natural element for inclusion in promotional campaigns – instantly identifiable, a visual cue that cuts right to the chase and lets the audience know what time of year what season we're celebrating. Wreaths are another item of decor that have proven to be an irresistible piece of Christmas ads across the years. 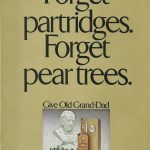 While some agencies went farther afield, and utilized mistletoe as a key part of their advertising. 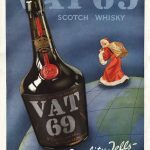 Christmas carols, likewise, conjure up immediate associations in the minds of viewers, and some distilleries cleverly used lyrical cues to get their message across. While others simply depicted carolers in full wassail, spreading good cheer with song and sippables. 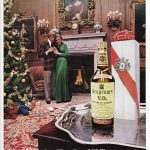 But of course, when it comes right down to it, the single most popular approach in seasonal alcohol advertising has been the giving, receiving, and opening of gifts. 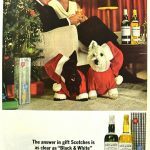 Many companies produced special holiday gift boxes, in an attempt to woo prospective buyers. And truly, as we've recently pointed out ourselves, liquor is always a wonderful item to pass along to your loved ones (and not a bad one to get for yourself, either). 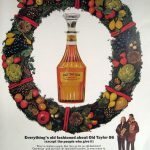 Four Roses came up with a particularly clever spin on this pitch – after all, if one bottle makes a great gift, why not buy and give three at a time? And as good as giving feels, one can't discount the thrill that comes from looking under the tree and discovering the perfect present. Even so, and as enticing as the gift of drink can be, one must always keep one's wits, and judge the situation wisely. For example, one should be careful in accepting refreshments from demonic children in seasonal regalia. And in case your holiday celebrations do get out of hand, one should make sure to stock up on essentials to ensure you're able to cope with the morning after. With that, I'm afraid I must conclude this round of boozy reminiscing – it's time to rejoin my coworkers, get back to arguing over the exact ingredients that go into a perfect gingerbread cocktail, and deal with other vital matters. There are presents aplenty to wrap, trees to finish trimming, plum puddings to prepare, and a precious few days remaining 'til we hang out the stockings and fall asleep listening for the sound of hooves on the roof. So on behalf of all of us here at the Alcohol Professor, I'd like to thank you on coming back with us on this trip back through time. And we offer our sincerest wishes that no matter what holidays you recognize, and whatever your beliefs, you enjoy a season that's merry, bright, and full of delicious drinks!